In spite of advances in the local treatment of malignant skin tumours and other skin diseases, radiotherapy remains highly relevant as a therapeutic alternative or under certain conditions even as the treatment of choice. Hardly any other procedure is capable of treating superficial as well as deep skin tumours with such precision according to their depth and without causing serious damage to healthy tissue. In particular, curative radiotherapy is most often used to treat basal cell carcinomas, squamous cell carcinomas, extensive precancerous lesions, lentigo maligna and lentigo maligna melanoma. 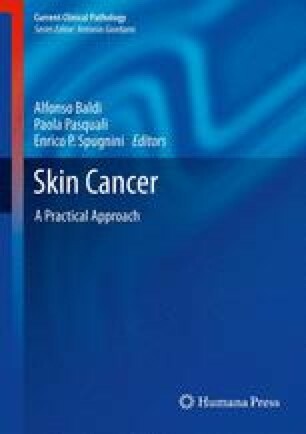 Ideally, moderately to larger-sized non-melanoma skin cancers in the facial region in patients over the age of 60 are treated with radiotherapy when surgery is not feasible. Even for inflammatory skin conditions such as chronic eczema or psoriasis, radiotherapy can be performed in cases of failure of other treatment methods. Palliative radiotherapy may be indicated for Kaposi’s sarcoma and T- and B-cell lymphoma; even primary cutaneous B-cell lymphoma can be treated curatively. The radiation quality mostly used in dermatology lies between 12 and 50 kV. Knowledge of physical and radiobiological parameters is important such as half-value depth, inverse square law and absorption law. Fractionated radiotherapy is an effective and well-tolerated outpatient treatment modality which should be considered according to the exact diagnosis, age of the patient, comorbidities, goals of treatment, lesion characteristics including location and not least patient preference. the absorption of X-rays is proportional to the thickness, density and atomic number of the material and inversely proportional to the energy of the X-ray quanta. is a radiation therapy that uses a linear accelerator where electrons are directed to the tumour site. It has low penetration and spares deeper tissues. it is the international energy dose unit of absorbed radiation dose of ionising radiation (IR). It is measured as the absorption of 1 J of IR by 1 kg of matter (1 Gy = 1 J/kg). involves exposing the skin to low-energy, non-penetrating radiation. It is mostly used in inflammatory skin conditions. is the depth in the tissue at which the intensity of the radiation or the dose rate has been reduced to half of the surface dose rate focus-skin distance (FSD), i.e. on the length of the tube. refers to the layer thickness that reduces the intensity of the radiation to half its initial strength. It increases with hardening of the beam. It is measured in aluminium. the intensity of the dose (dose rate) of X-rays emitted from a point source is inversely proportional to the square of the distance from that source. is the radiation that removes an electron from an atom. In medicine, it is used in radiography (diagnostic X-rays, 20–150 kV, used to obtain images from inside the body), in nuclear medicine as tracer method and in radiation therapy for its damage on DNA cells (superficial X-rays, 50–200 kV; orthovoltage X-rays, 200–500 kV; and megavoltage X-rays, 1–25 MV). it is a type of external beam radiotherapy. It involves the use of an X-ray tube with a beryllium window set at a determined energy, with the target lesion positioned at 20 cm, a 50 % depth dose at 1–1.3 of skin, a dose of 20 Gy per treatment with 5 treatments given 3–4 days apart and a 5-mm margin of normal skin included, with an accumulated dose of 10,000 rads. or, “deep” X-rays, are produced by X-ray generators, in the range of 22–500 kV and penetration of about 4–6 mm. is the treatment to alleviate symptoms without curing the disease. maximum ratio of doses at 2 symmetric points relative to the central axis of the field. is the spectrum of radiant energy produced by a given radiation source with respect to its penetration or its suitability for a specific application. It determines the depth of penetration of radiation into the tissue. is the dose rate at the surface of the skin. It is expressed in Grays. it is the treatment of a disease using radiation, especially by selective irradiation with X-rays or other ionising radiation and by ingestion of radioisotopes. Individual units of X-ray energy.